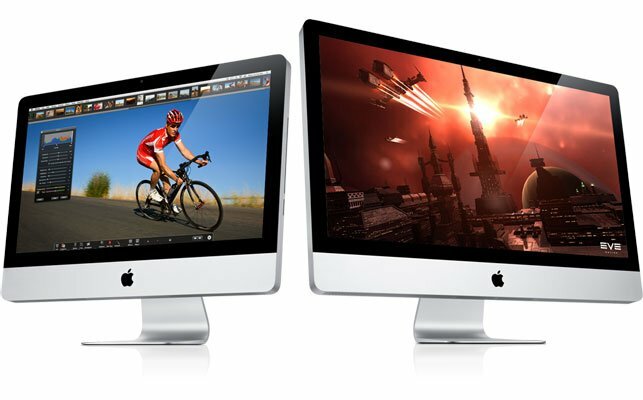 As well as updating its range of Mac Pro computers, Apple [AAPL] has also updated its iMac range with a range of Intel Core i3, Core i5 and Core i7 processors. Prices start at $1,199 for the 21.5 inch iMac, and $1,699 for the 27 inch iMac, and both models boast more powerful graphics, up to 16GB of DDr3 RAM, an SDXC card slot, and a choice of ATI Radeon graphics cards. You can see full details of what is new in the new Apple iMac range in the press release below. CUPERTINO, California-July 27, 2010-Apple® today updated its all-in-one iMac® line, widely praised as the world’s best desktop computers, with the latest Intel Core i3, Core i5 and Core i7 processors and powerful new graphics. Starting at $1,199, the new iMac line is the fastest ever with dual-core processor speeds up to 3.6 GHz, quad-core speeds up to 2.93 GHz and discrete graphics including the powerful ATI Radeon HD 5750. The new Magic Trackpad, with a smooth glass and aluminum design, gives iMac users the same intuitive Multi-Touch™ gestures that Mac® notebook customers have come to love and is available separately for $69. Every iMac comes with Apple’s innovative Magic Mouse and customers can also order the new Magic Trackpad as an option. The Magic Trackpad brings the intuitive Multi-Touch gestures of Mac notebook trackpads to the desktop. With its glass surface, the wireless Magic Trackpad enables users to scroll smoothly up and down a page with inertial scrolling, pinch to zoom in and out, rotate an image with their fingertips and swipe three fingers to flip through a collection of web pages or photos. The Magic Trackpad can be configured to support single button or two button commands and supports tap-to-click as well as a physical click. Continuing Apple’s commitment to the environment, Apple’s desktop lineup is a leader in green design. The iMac meets stringent Energy Star 5.0 requirements and achieves EPEAT Gold status. * iMac features LED-backlit displays that are mercury-free and made with arsenic-free glass. iMac uses PVC-free components and cables, contains no brominated flame retardants, uses highly recyclable materials and features material-efficient system and packaging designs. A new Apple Battery Charger provides a convenient and environmentally friendly way to always have a fresh set of batteries for your Magic Trackpad, Magic Mouse and Wireless Keyboard. The Apple Battery Charger is available for $29 and comes with six long shelf life rechargeable batteries. The new iMac line is shipping now and available through the Apple Store® (www.apple.com), Apple’s retail stores and Apple Authorized Resellers.